Add 2 Celeste Stein Compression Socks to Cart, Get $3 Off each! I love all of my Celeste Stein Compression Socks! I have a medical condition that requires compression socks. I happened to find Celeste Stein's wonderfully colorful and stylish socks by looking on the Internet. I must say I am VERY pleased with my purchases. I have over 20 pairs with various patterns. If your doctor tells you need to wear compression socks, don't settle for those ugly, thick elastic ones. Try a pair or two of Celeste Stein's and you'll be glad you did. By the way. Miles Kimball carries the best I've worn yet! Such a good variety of designs to choose from! I wear them daily. I have many colors of them. My doctors all comment on how cute they are. I LOVE THESE COMPRESSION HOSE. THEY PROVIDE JUST THE RIGHT AMOUNT OF SUPPORT. THE DESIGNS ARE SO FUN AND ADD A MUCH NEEDED SPLASH OF COLOR TO SURGICAL SCRUBS. I HAVE RECOMMENDED THEM TO ALL MY COLLEAGUES. THEY STAY PUT AND DON'T TWIST OR SLIP DOWN NOR ARE THEY SO TIGHT THAT THEY LEAVE A MARK AT THE TOP. CAN'T WAIT TO ORDER MORE! A doctor recommended I buy 'over the counter' compression stockings to 1)reduce swelling in my ankle/instep area, and 2)stop using my nylon knee hi's because they leave severe indent at top which can affect circulation. 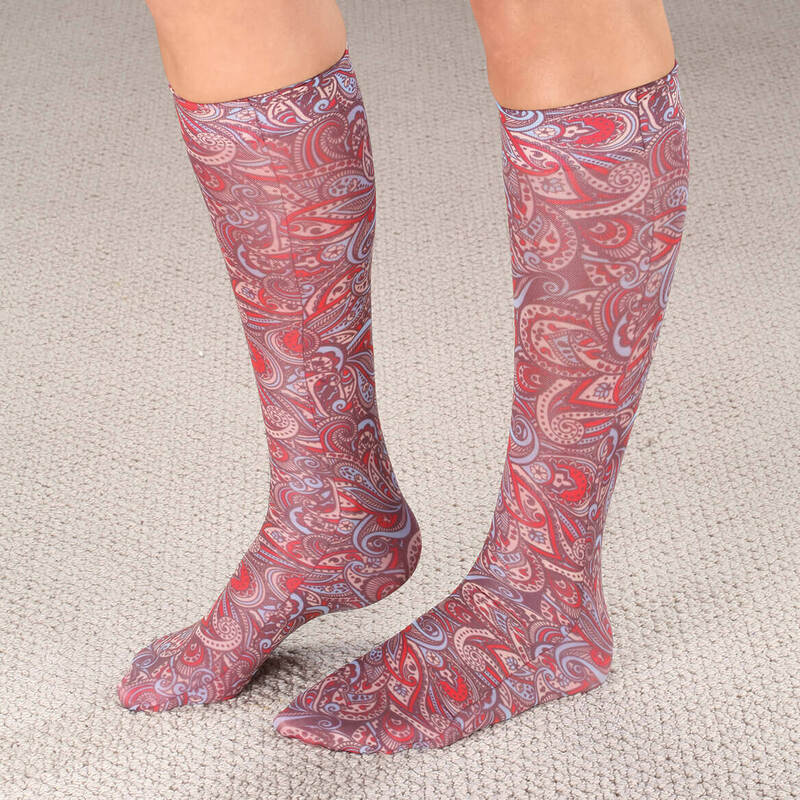 These come in a variety of colors/prints, and are way cheaper than the 'prescription' compression stockings. My doctor said she wears them all day to help reduce fatigue and keep good circulation. I wear them to help reduce swelling. They are thin enough to wear in most shoes. I would buy again if needed. These fit me well. The stretchiness was better and I could get them on with ease. very attractive, wish they were a little more durable. They are so cute, cannot tell they are compression socks. Wish they lasted a little longer. these compression hoses are just what I was hoping for . I hope they will come in other colors in the future. I like to wear them with a dresser shoe and when I go out in the evening. Compression almost too much for me to use but will try harder to get used to them. I wore these stockings on a recent Ireland/England trip. Not only did they help with leg swelling but they helped identify me in our travel group. My nickname was Socks. I will be ordering more!!! I have the butterfly and blue lace ones. I have been wearing compression stockings for several years and I like that I could find some in fun prints and colors. Sorry I bought them. They are very tight. Made for very skinny legs. These compression socks would be great if they had a heel wedge in them. they gathered/puckered in the front of the heel area and also slid down the calf. That doesn't help if you need it for blood clots. the compression part was wonderful, otherwise. It really needs a heel wedge to fit properly at the ankle area. They fit well and are made nicely. Pretty colors. Just a bit pricier than other brands. The "lace" looks nice, but they don't stay up. The whole reason they are needed is because of long hours on my feet and walking, so they really don't fit that. I have a couple of them already. I have to wear compression stockings. I love that these are stylish. They make my legs feel better because they reduce the swelling in my ankles. I have lower leg edema sometimes and need to wear compression stockings when on my feet for long periods and I like the designs of these stockings. I plan to purchase more if these work out. My wife suffers from a leg condition and must wear these socks daily. 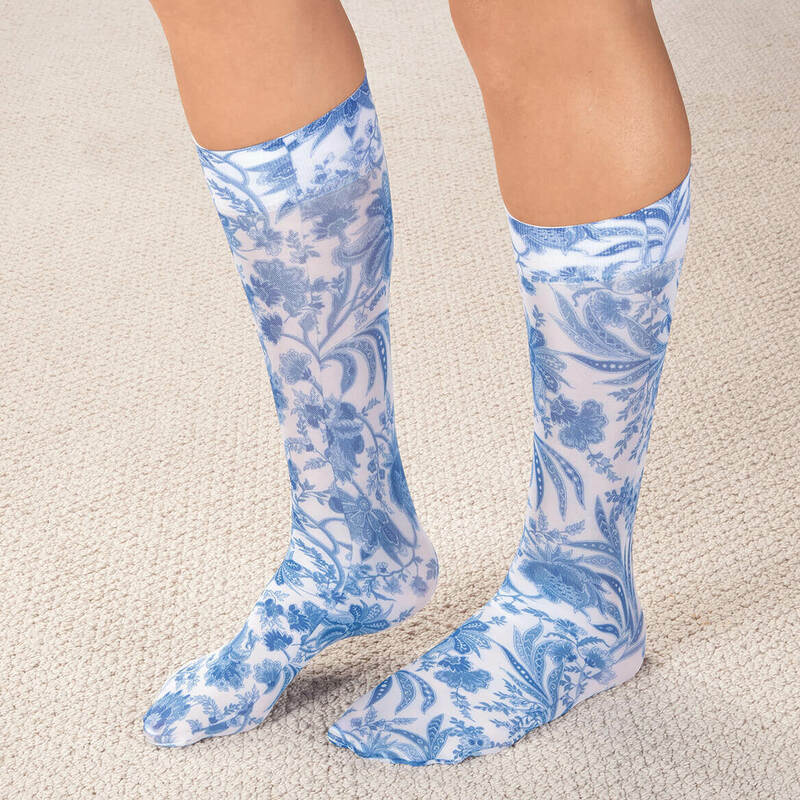 She likes the Celeste Stein brand best, we have ordered from Miles Kimball previously for these compression socks, she enjoys the variety, style and funky patterns. They work great! They fit well and are very cute! I get compliments on them all the time. When you have to wear compression socks they may as well look good! Must wear sock now, they might a well pretty rather than black, tan or white ! they have served me well. Once I accepted that I needed to wear compression socks I wanted something "fun". My doctor recommended that I wear socks with mild to moderate compression.. When I first saw Celeste Stein compression socks available in a variety of fashion colors, I had to try them! I have ordered these socks from Miles Kimball before and have been very satisfied with them. They are comfortable while providing the right amount of compression.for my needs. The variety of color and pattern choices is a plus! Something different. Have to start wearing compression stockings and wanted a change. Hope they fit. I like all the different colors, choices better than the tan that I usually have to get. I need these as I'm going into the hospital and they looked pretty. New to these nylons--need different colors! I ordered these for my daughter and she is still young and the colors were very nice for a younger person. Second purchase - good fit, not too tight, easy to get on. I love these socks. They are easy to get on, don't roll, and wash up beautifully. I ordered these because they come in queen size. Very comfortable and they really do help keep the swelling down. I wear support hose and I thought they would be something different. Thought my daughter would have fun with a colored pair of compression socks. Help with circulation and I like the wild assortment of colors. Colors were muted and should blend in with clothing in general. My wife has what's called, Lymphodema (swelling of calves and feet), she needs these compression socks badly. I will be purchasing more at a later date. Very glad to see you carry them, she loves the colors and variety! Thanks! My daughter is a nurse and these will make a nice birthday present. To try them out for me. fancy socks to have a change from the plain everyday hosiery. Legs feel better with compression hosiery. I need them, to help my legs. Also, it is wonderful to have options so pretty ! I am a health care worker who spend 10 -12 a day on their feet. Protect against thrombosis when travelling by air. I had foot surgery back in December and my doctor indicated these would help to keep the swelling down. I needed support stockings and wanted some which were pretty. The Stein Compression Socks have lasted me over a year of wearing them 3 times a week. The color stays and they are easy to care for. 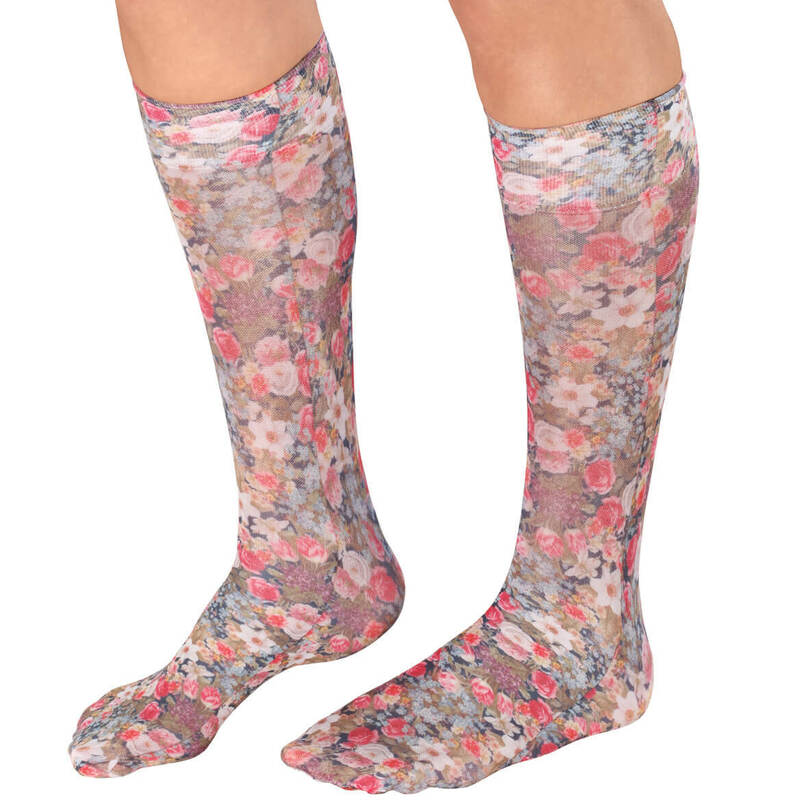 Based on information in available reviews, it appears that these oh-so-fun compression socks are tube socks--not shaped, graduated compression. Am I correct? BEST ANSWER: They are not "pre shapped" they are kind of like knee hi hose, only more durable. I bought them for my daughter who was told to wear them while working as she stands a lot. She says they do help her. Compared to the 3-400 dollars it was going to cost to get a prescription filled, these were an amazing find. I would purchase them again. These do not have heals on them. But, they are graduated compression socks. I just have too large of a calf to keep them up. they slide down my leg. the compression part is great! Yes, they are the tube design. However, they fit great and feel wonderful! I have 3 pairs. You are correct. They are comfortable and fit well. What are the calf and ankle measurements for regular and queen size knee hose? BEST ANSWER: The 15-20 mmHg refers to the amount of pressure used to compress the leg. The higher the number, the stronger the compression aND the tighter the stocking.. I believe the catalog gave the dimensions in inches to go around the largest part of the calf. I have somewhat swollen ankles, and had no problem getting these over the ankles, nor up with the inches given for my calves at 17" around..
My legs are very thick, and I have problems keeping these or other thigh highs from slipping into the fatty part of the leg, and digging in, but I am not able to change them myself, so they were not changed daily, which might have helped. If your legs are slender, they work much better. Thank you for your question. Fits women’s shoe size 5-11. Regular fits calf circumference up to 15". Queen fits calf circumference up to 21".We hope this information will be of help to you. calf measurements, according to description ,, are reg..up to 15"" around, and queen size is up to 21 " around...These are very pretty,and give firmer compression than I expected. Which stockings are which? Can seem to tell which name goes with the third stocking in the first picture. BEST ANSWER: I think that is butterfly garden, which I have ordered in the past. Very pretty! But the online photos and the color names are very poorly matched and hard to determine. Good luck! Bright botanical, third (from left to right). style names aren't by socks.how can I be sure I choose the right ones? BEST ANSWER: Thank you for your question. The set you have included with your question colors are black, blue paisley, bright botanical and leopard. We hope this information will be of help to you. Thank you for your question.We hope this information will be of help to you. Click on the style you like, and the name of that sock will come up. I really like mine, and they take care of edema really well. What is the size chart for Queen? BEST ANSWER: Thank you for your question. The Queen fits calf circumference up to 21" and fits womens shoe size 5-11. We hope this information will be of help to you. What is the length of these socks from ankle to knee? BEST ANSWER: Thank you for your question. These were so far to measure from the ankle because they are basically tights, there is no place that indicate where your heel or ankle would be. The queen measurements are 11” unstretched, 20” stretched and the regular measurements are 10” unstretched, 19” stretched. We hope this information will be of help to you. Which side is knee side?